By utilizing skills of our dexterous workforce, we are manufacturing and trading a comprehensive assortment of Heat Shrinkable Single Core Cable Termination. 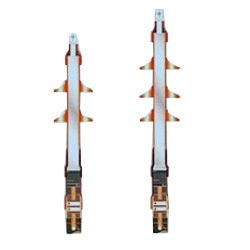 This Heat Shrinkable Single Core Cable Termination is applicable for 11/12kv, 22/24kv, 33/36k single core pvc/xlpe/rubber insulated screened cables. Solder-less and special purpose earthing kits are also available on request. Polymeric insulators and t brackets for installation of terminations on single pole are available on request. All our accessories are optional items are specifically designed keeping in mind specifications of our customers as well as the reactive aspects of our products. Our range is extensive and all are manufactured at our state of the art manufacturing facility, complying with stringent international quality norms. We “Powertech Engineers” are leading manufacturer and trader of a durable collection of Busbar Tubes, Industrial Sleeves, Cable Breakouts, Heat Shrinkable Tapes, Heat Shrinkable Accessories, Heat Shrinkable Cable Terminations, Heat Shrinkable PILC Cable Terminations, etc. Incepted in the year 1999, we are a well known company, offering qualitative range of cable terminations and accessories to the clients. We are a Sole Proprietorship Company that is managed under the headship of our Proprietor, “Mr. Rajesh Sharma”. Located at Ambala (Haryana, India), we have developed an ultramodern infrastructural unit where we manufacture these cable terminations and accessories in a huge quantity with assured quality. Brands in which we deals are Raychem, RPG, Bensons, 3M, Scapa, etc.